Wood floors are very popular flooring choices in Indianapolis. Hardwood flooring will always be at the top of the list for someone who wants a wood floor, however, it isn't always at the top of the budget-friendly list. That's when our designers recommend looking at laminate wood floors. Laminate wood used to have a stigma of looking like a cheap knock-off of hardwood. Today's laminate wood dispels that notion immediately. At first glance it's hard to tell any difference between a well-made laminate wood floor and a natural hardwood floor. Just what are the benefits of laminate wood flooring and are they right for you? Read on to learn more. Laminate wood floors make wood flooring available to more homes than ever before. With the look and feel of wood, laminate wood floors are manufactured with different materials which makes them more affordable. Laminate wood flooring is also more flexible with installation requirements and less vulnerable to moisture. Laminate wood flooring offers quality, beautiful wood floors to fit any budget. What are laminate wood floors? Today’s laminate floors are available in a multitude of designs, patterns, and textures. You can mimic the look of nearly any solid hardwood with laminate wood flooring. Perhaps the most distinguishing feature of laminate wood flooring is the final layer that is bonded on top of the floor - the layer that you see. This final wear layer provides protection and wear resistance that stands up to even the most active households. What are the main benefits of laminate wood floors? Lower cost: laminate wood is typically available at a lower cost than traditional, solid hardwood. Better fit in most spaces: Laminate wood is sold in convenient 4 foot strips and also available in tiles of varying sizes. It's easier to install in a hard-to-fit space than traditional hardwood. Easier to clean: The top, wear layer of a laminate floor protects the material from stains and small spills making cleaning relatively easy. Typically the only regular requirement is sweeping the floor to remove grit and dirt. Excellent choice for allergy sufferers: Laminate flooring is naturally resistant to the growth of mold and bacteria. It can also be treated with special allergen resistant and anti-bacterial coatings to make them even safer. If you're considering wood floors for your Indianapolis home, don't overlook laminate flooring. Today's manufacturing capabilities have created a floor that makes the warmth of hardwood more accessible than ever before. 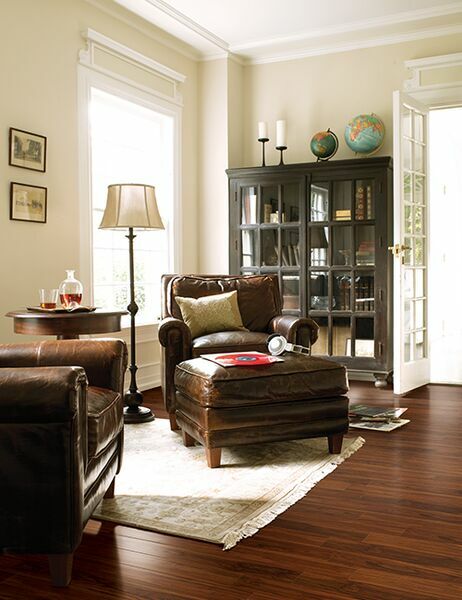 Stop by our Indianapolis flooring showroom in Castleton to shop our wide selection of laminate wood.